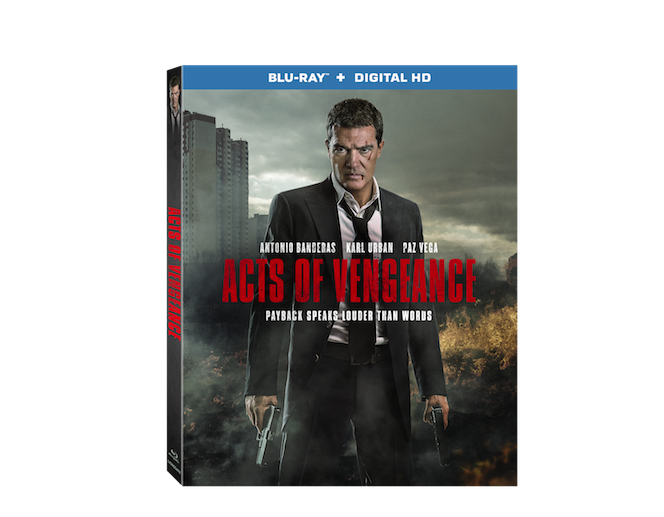 ‘Acts of Vengeance’ is coming to Blu-ray with Antonio Banderas! Antonio Banderas gets silent and kills everyone in ‘Acts of Vengeance‘, which comes to Blu-ray and Digital Streaming on November 28th. Banderas has always been a fun actor, delivering excellent performances in the action, dramatic, and comedy genres. It’s a short (87 minute) violent action film from director Isaac Florentine. Looks to be on one extra available on this one. Oh yes, Karl Urban is in it too. A fast-talking lawyer (Antonio Banderas) transforms his body and takes a vow of silence, not to be broken until he finds out who killed his wife and daughter, and he has his revenge. This entry was posted on Friday, November 3rd, 2017 at 2:20 pm	and is filed under Film, News. You can follow any responses to this entry through the RSS 2.0 feed. You can skip to the end and leave a response. Pinging is currently not allowed. « Film Review: ‘Thor: Ragnarok’!